Last week we looked at Robbie Kellman Baxter’s “The Membership Economy” which tackles the recurring revenue topic from the angle of building a membership. Warrillow’s spin is a little bit different in that he is just talking about subscription revenue without all the fluff around freemium models and giving stuff away to build a membership without a clear line of site on how to make money. Conversely, throughout his book, Warrillow is able to interject personal experiences. He recounts his own history of transforming his research and consulting business from “one and done” style engagements, to a prepaid subscription research business. He’s even able to speak about a failed attempt to move to a subscription model and having to go back before he finally went all in. I mentioned last week that I’d previously read Baxter’s book, well the same thing is true of “The Automatic Customer” – I’d read it the first time over two years ago and really liked it. The interesting thing about a book like this is you pick up things and bits of knowledge when you read it, but where it comes into its own is when you’re running a recurring model and thinking of adding additional elements to your subscription. Where I’m at right now with Casual Marketer, this book was great for me the second time through – it re-affirmed a few ideas I was having and gave me pause to think about a few other things. That’s the sign of a good book in my mind. To me, the strongest aspect element of this book, in my opinion, are some of the practical elements. “The Automatic Customer” is broken down into easy to understand sections where Warrillow walks you through the what subscription businesses are, the historic context and the current state of play. He then goes through a series of different subscription models using interesting and relevant case study examples of each model. Finally, he goes through the application of building a subscription business and shares the various metrics and measurements you can use to work out where your business is at and what you can do to improve it. This is the gold in this book – you can find your preferred model for your business, find some complimentary models to help add breadth to your offerings, then Warrillow tells you how to measure your progress and things to watch out for. It’s like a short little masterclass in running a subscription business. The obvious comparison is with the book I reviewed last week, “The Membership Economy” and you might be thinking, so what’s the difference and which should I choose? The reality is, they’re very similar concepts and for most people, they might be indistinguishable. When we talk about a “subscription business” we’re talking about the primary means of revenue generation, whereas a “membership” is much broader as a concept and might not even have a revenue model. Memberships are about giving people a sense of belonging, whereas subscription gives them paid access to something. I’m a subscriber to the Dollar Shave Club, but I’m a member of my Frequent Flyer club. The Dollar Shave Club sends me new blades every month for an automatic $10 purchase, but my Frequent Flyer club gives me special access to lounges, discounts and other goodies because I belong to the program. This book is great and I strongly recommend it. I’ve run numerous subscription businesses with recurring revenue models over the years and both times when I’ve read this book I’ve come away with new ideas and things I could try. Without sounding too preachy, you really should be thinking about how you can add a recurring “automatic customer” aspect to your business. 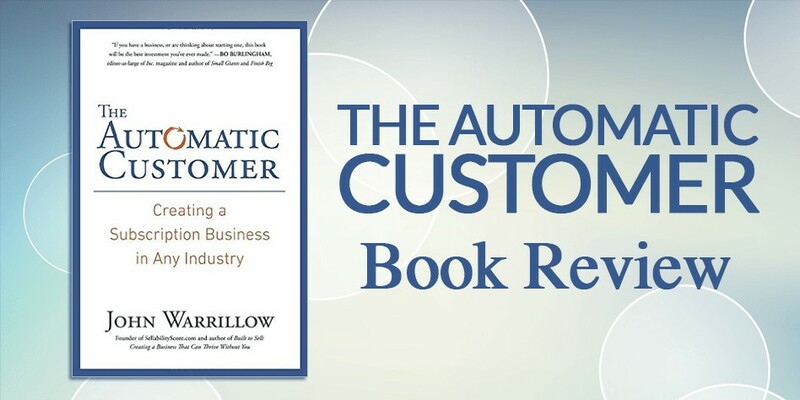 John Warrillow’s “The Automatic Customer” is a great starting point to help you on your journey – it’s informative, interesting and engaging, you should take the time now to pick it up and give it a read. I agree. I read it recently and got a lot of value from it, and found it easy to whizz through the first time round. It’s on my list to re-read in a month or so as I know there’s layers to it. I have read it a couple of times – in fact, I picked up the Audible version about a year ago so that I could listen to it more frequently.